A robotic Toyota Prius called 'Pribot' went for a drive around San Francisco earlier this month. 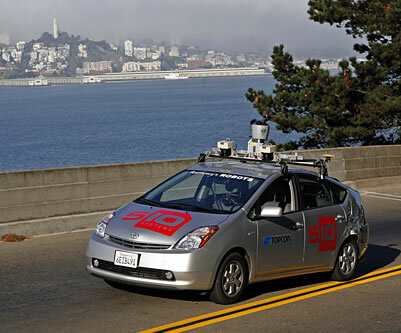 The self-driving car used computer maps and GPS to find its way around without human assistance. Pribot is the creation of engineer Anthony Levandowski, a 28 year-old resident of San Francisco. Technovelgy readers may recall that he also created the Ghostrider self-steering cycle - see Ghostrider Robot: Sterling's Smart Motorcycle? for a refresher course on this 2004 device. In preparation for last week's 25-minute drive, Levandowski drove the route in advance a few days before, scanning the surroundings with a pulsed laser. "We built a precise map of what the area downtown looks like," he said. That's what Pribot used to navigate the course. More precisely, the 'bot relied on a combination of GPS, inertial guidance, and a pair of infrared lasers that scanned its surroundings and compared its location with the previously built 3D map. Yet because robotic vision remains nowhere near as flexible as human eyesight, 'bots need more accuracy than GPS can generally deliver. Levandowski found a solution in the RTK base station sold by Topcon, a Pribot sponsor, which typically sells to farmers aiming to do carefully aimed seeding and fertilizing. RTK boasts an accuracy of one inch or less, as long as the base station is no more than 3 to 6 miles away. SF readers of course recall the wonders of fictional self-driving cars, like Heinlein's 1941 Camden speedster.